This Beautiful Custom built 4 br home is set in a serene country environment & has wonderful detail throughout. Main living area features Open Floor Plan, vaulted ceilings, gorgeous entry foyer, archways, whole house sound system, and lots of natural light. The Large Master Suite features coffered ceiling, bay window, door leading to the deck, whirlpool tub/separate shower, double vanity, & xl walk in closet. Kitchen area features an island w/breakfast bar, custom-built cabinetry, & breakfast nook. The lower level is made for entertaining featuring bar, large family room, full & half bath, media room, office, exercise room, 9ft ceilings & large wrap around storage area. A 2nd Master Suite can be found with built in shelving, 3/4 bath, & large walk-in closet. Exterior of this home features beautiful landscaping, large covered deck as well as an open deck leading down to a fire-pit/picnic area. 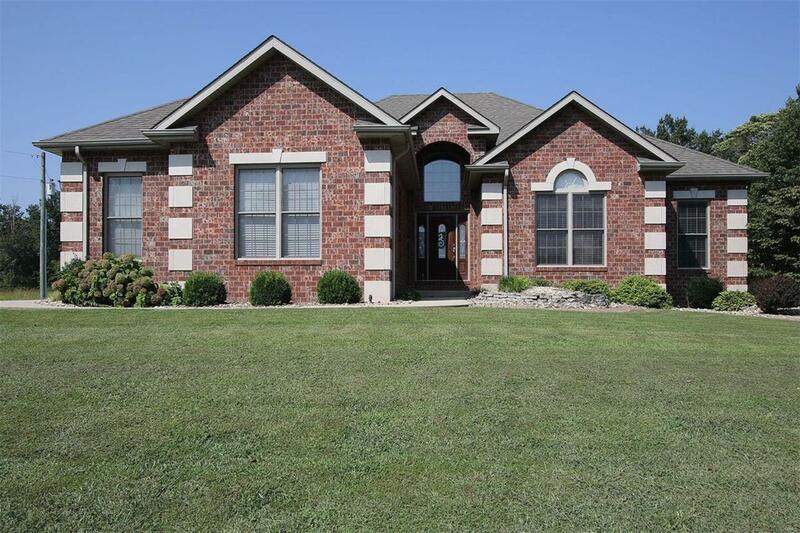 This meticulously cared for home sits on 2.5 acres and has a pole barn w/concrete floor.